2018 is summed up on our blog posts. 2017 is summed up pretty good on our blog posts, and on our From Deep Short printable newsletter. Tuesday, January 19, 2016 – 6:30 PM – First Fan Club business meeting of the year at American Legion Post #143, 214 Market Street, New Cumberland. We will discuss how the APBA Baseball game achieves such realistic results. Weather permitting. Tuesday, February 16, 2016 – 6:30 PM – Fan Club business meeting at American Legion Post #143, 214 Market Street, New Cumberland. Scheduled guest speaker: Jessica (Kauffman) Moyer, Senators Senior Account Executive, who will fill us in on her very first Baseball Winter Meetings experience. We’ll also hear from President Kevin Kulp and meet the 2016 Senators interns. Weather permitting. Tuesday, March 15, 2016 – 6:30 PM – Fan Club business meeting at American Legion Post #143, 214 Market Street, New Cumberland. Guest speaker will be Senators Senior Sales Executive of Corporate Development. 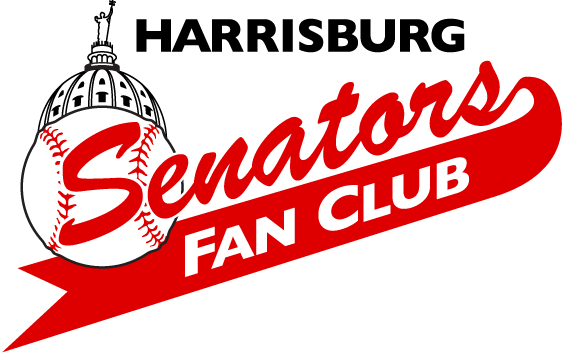 Tuesday, April 5, 2016 – “Senators Welcome Back” banquet at the Susquehanna Club, Ross Avenue, New Cumberland. Reservations: $29.50 per person; children 12 and under $12. Thursday, April 7, 2016 – Senators Opening Night at Altoona. Thursday, April 14, 2016 – Senators Opening Night at Metro Bank Park. 6:30 first pitch against Reading. Tuesday, May 17, 2016 – 6:30 PM – Fan Club business meeting at American Legion Post #143, 214 Market Street, New Cumberland. Scheduled guest speaker: Senators Community Relations Coordinator, Blair Jewell. Tuesday, June 21, 2016 – 6:30 PM – Fan Club business meeting at American Legion Post #143, 214 Market Street, New Cumberland. Guest speaker will be Andrew Linker, former beat writer for the team and current Senators’ official scorer. Tuesday, July 19, 2016 – 6:30 PM – Fan Club business meeting at American Legion Post #143, 214 Market Street, New Cumberland. Guest speaker will be a Fan Club favorite: Jason Bristol, CBS21 Sports Director. Saturday and Sunday, August 20 and 21, 2016 – Fan Club weekend bus trip to see the Lehigh Valley Iron Pigs visit our former Senators as the Syracuse Chiefs. To learn more, please call Vice-President Jeanne Jacobs at 717-774-2730 today. Tuesday, September 20, 2016 – 6:30 PM – Fan Club business meeting at American Legion Post #143, 214 Market Street, New Cumberland. Guest speaker will be Jack Fisher, who will present a program on Christy Mathewson, “The Gentleman Hurler”, who is buried in the Lewisburg Cemetery adjacent to Bucknell University. Sunday, October 2, 2016 – Traditional final Sunday home game at Nationals Park. The Miami Marlins face the Nationals this year. As recently as 2013 we took two buses to see this game. In 2014, we were treated to Jordan Zimmermann’s no-hitter! Please call Vice-President Jeanne Jacobs at 717-774-2730 today to learn more. Tuesday, October 18, 2016 – 6:30 PM – Fan Club business meeting and election of officers at American Legion Post #143, 214 Market Street, New Cumberland. Instead of a guest speaker, Game 7 of the 1960 World Series will again unfold before your eyes and ears. Sunday, December 11, 2016 – 5:30 PM – Annual Fan Club Christmas Party at American Legion Post #143, 214 Market Street, New Cumberland. Enjoy a seasonal buffet dinner, games and gifts. $25 per person. Dinner served at 6:30.